While visiting my parents at Christmas time, my Mum gave me a white plastic bag with "Stamp collecting is fun!" emblazoned on it, which was full of stamps and envelopes. 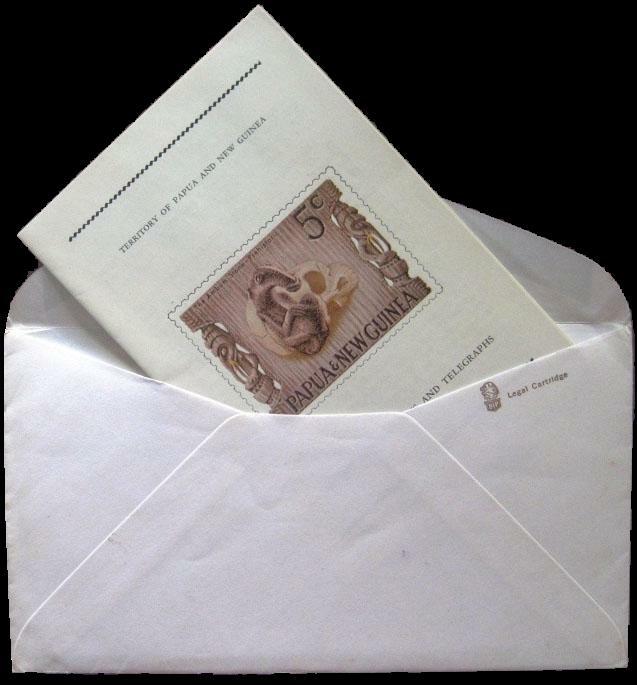 She couldn't really remember the details, but given that it was postage paraphernalia, she assumed that wherever it had come from it was meant for me. I took a bit of a look inside it, and then proceeded to stash the bag in the boot of my car (alongside other miscellany that I have yet to find a home for, including a blue glitter cowgirl hat and a picnic rug). Last weekend I remembered the bag of post from my Mum and I took it out to explore. To my delight, it was a veritable treasure chest of post, and post-related items. Mainly it was a bag of First Day Covers. 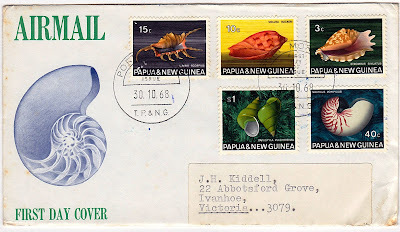 My own stamp collection does not encompass FDCs, which I always thought of as basically an empty envelope with a fancy postmark from the first day of a stamp's issue. But it turns out that FDCs are way cooler than I had realised, and the ones I discovered this weekend are pretty special for a number of reasons. 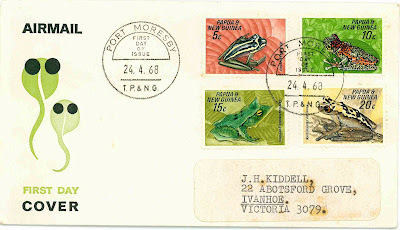 The first reason is that many of the First Day Covers are addressed to J. H. Kiddell, my Dad's grandfather, my great-grandpa, who was always referred to as "Pa Bert". Pa Bert passed away well before my time, but it makes me pretty happy to think that he was a bit of stamp nerd, just like me. Or rather, in this respect, I am just like him. The second reason this collection of FDCs are totally cool is that they are all from "Papua and New Guinea" - and date from the late 60s up until the early 70s, when Papua and New Guinea was still a Territory administered by Australia. 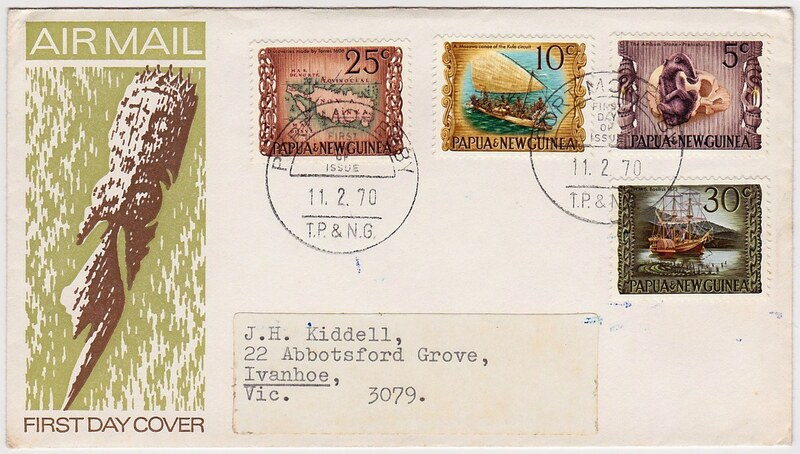 I am completely besotted with 'post' in a large part due to the history inherent within stamps (and other postage related items!). 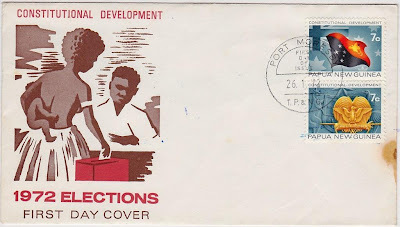 This is beautifully exemplified by one of the FDCs within the collection: a 1972 issue commemorating "constitutional development". 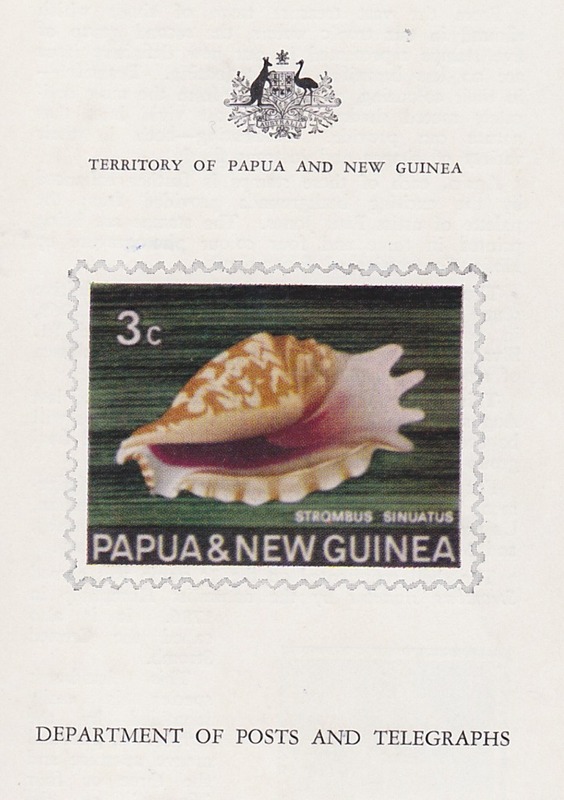 Papua New Guinea eventually became independent from Australia in 1975. 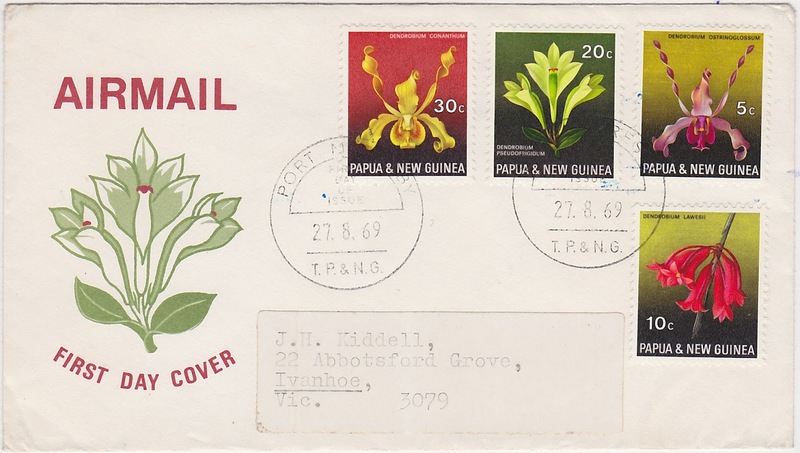 The third reason that this collection of FDCs totally knocked my socks off, is because within the envelopes were delicate little brochures explaining the stamps. The decorative envelopes! The graphic design! The history! And to top it all off there are brochures inside! Wow. I heart FDCs. 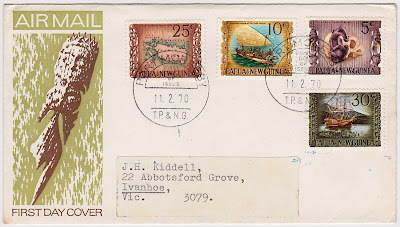 Maps, artefacts, stamps: these are a few of my favourite things. And they are all combined into one perfect First Day Cover. Thankyou, Pa Bert. Department of Posts and Telegraphs! Thanks for your comment! I am so glad it led me to your blog, as I have been wondering about that 5 cent stamp for a while now. Did the brochure say anything about the skull? Hi Laura! Thanks for checking out my blog! The little brochure did not actually mention the skull depicted on the stamp. But it is quite a striking aspect of the design, isn't it? I guess it is just added to the design to make the viewer realise they are looking at something ancient!